I was super lucky to have been in Scotland during their recent independence elections. While many people commented that it had become quite a vicious argument, I (as an American) was surprised at how pleasant everyone was. You would never see a display of posters arguing both perspectives hanging out together as I did in Kirkudbright. The iconography was also fascinating. 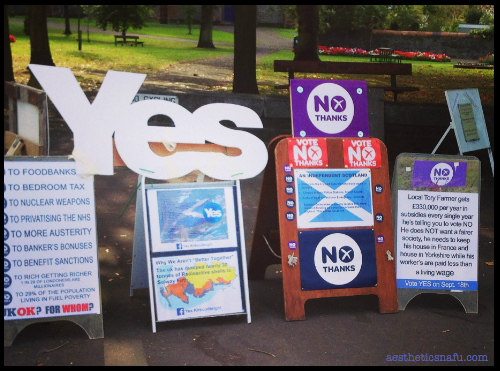 We were mainly in the north so most of the signs and stickers we saw were for Yes, but there was a fair amount of No in Edinburgh and Glasgow. Since I’m still sorting through my 100+ Yes pictures, here are some of my favorite No options. (There were several versions of the UK flag/Uncle Sam/Queen sticker below including a Harry Potter one). This entry was posted in Experiences, Places, Scotland. Bookmark the permalink. Kathryn McLellan is a qualitative social scientist living in Chicago with her husband and plants. She once had a $50.45 library fine. Despite not speaking Spanish nor having ever taken an econ class, she is an expert on Chilean economics. Did you know that the official term for people who make hooked rugs is hookers? Roadtripping Route 66 (ish): Part 1 of ? ?